Displays how two great families have come together. Why not start making your family history something to shout about, today! 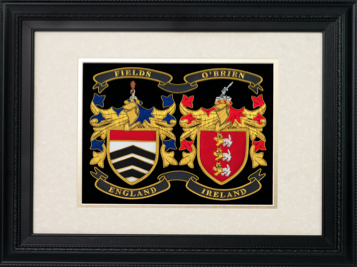 A great way to display your family roots’ from both sides of your family ‑ and a fascinating talking point in any home, office or den. We research both your names thoroughly from a database of over 800,000 names of European origin and provide you two authentic Coats of Arms. Side‑ by‑ side in an antique‑ style frame.